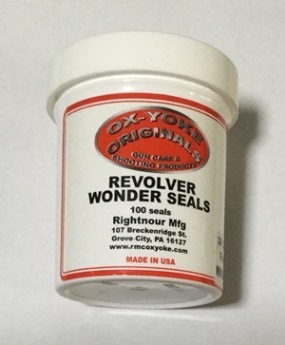 Ox-Yoke Originals Wonder Seals - New preformed seals for sealing chambers on black powder revolvers to help prevent crossfires when shooting. Easy to use simply place seal over ball on end of cylinder and push it in place to expand it to make a seal, no need to smear lube or grease to prevent a crossfire. There is currently 8 of this item in stock. This item was added to our catalog on Sunday 05 August, 2018.